Aerial Dance Basic Complete Hardware Setup Kit for Trapeze Hammock Sports Aerial Lyra Flying Yoga. 3 x Ball Bearing Rope Swivels - 30kN/ 6700lb. 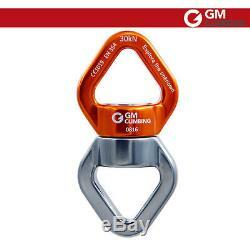 6 x Screw Locking Carabiner - 22kN/ 5000lb. 1 x Small Rigging Plate - 30kN/ 6700lb. 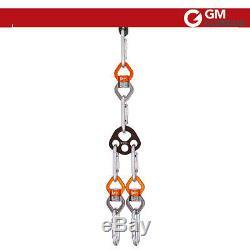 These products are for mountaineering, rock-climbing, industrial work, aerial activities and/or rescue use only. Any person involved in these activities must obtain qualified instruction of the proper use of these products prior to using them. Incorrect use or improper maintenance could lead to serious accidents even fatal. Please read carefully or learn enough knowledge before use. Using an Aerial Yoga Hammock relieves stress, helps with flexibility, and increases strength. Spending just a few minutes stretching with the Aerial Yoga Hammock will help your back, neck or shoulder muscles engage in a different way. You can do an action similar to swimming by kicking your feet as you are suspended in the hammock. Or, you can sit on the floor and have your neck supported in the hammock for a release of neck tension. There are stretches, spine twists, and core conditioning you can try. Some of our customers say the Aerial Yoga Hammock is their "home spa". Our complete trapeze kit has all the hardware you need to show off all your hard earned aerial skills. Simply attach your trapeze bar and the rope or cord of your choice and show all your friends what an incredible aerial acrobat you have become. Swivels will keep your fabric from twisting on itself which makes it hard to separate. Swivels also reduce the lateral stress on your attachment point. Swivels are meant to keep you moving safely. We carry swivels that are made with aluminum, but they use steel ball bearings inside. We inspect our swivels with each use. Retire the swivel if it has a crack, sharp edge, burr, irregular rotation, or if it does not spin without resistance. Protect your rotor from water, heat, or corrosive materials. Swivels have the ratings engraved on them, as they need to meet the proper safety standards. All our equipment is designed and built by industry standard companies, to withstand the rigors of life safety and climbing. 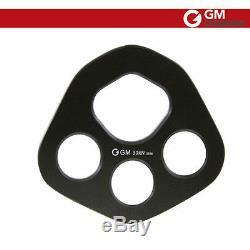 We have best quality, smoothest hardware for use in your aerial dancing and aerial silks mounting kits. 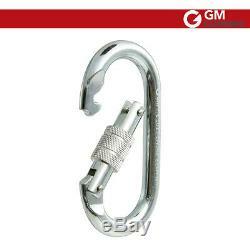 Our ball bearing Swivels will not wobble or bind, the Carabiners are strong and auto locking. 30KN Climbing Rope Swivel Connector / Full Bearings / 6700lbs. For use with static and dynamic ropes placed between a load and either rope or cable, the TWISTER avoids severe rope twisting while the load turns. Net weight: 156g / 5.5 Oz. Working Load: 750KG / 7KN. MAX Working Load 750 kg. 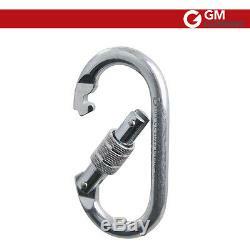 22KN Steel O Carabiner Screw Locking / 5000 Lbs / for Climbing. Steel connector for work at heights. Strength - closed gate: 22 kN. 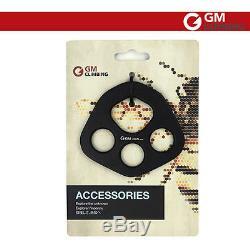 Gate opening (d): 17 mm. Designed especially for industrial use. 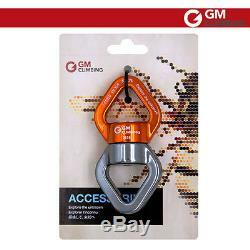 Ideal for pulleys, tackles, ascenders or descenders. Certification(s) : CE 1019 EN362. Aluminum Bear paw Rigging / Multi Anchor plate / Device for multi-point anchoring. Helps to organize karabiners at the anchor point. Provides efficient force distribution at different load directions. Rounded holes allow direct attachment of ropes to the rigging plate (any hole). If you are dissatisfied for any reason, please do not be quick to leave negative/neutral feedback. We work hard to make sure EVERY CUSTOMER 100% SATISFIED and resolve any problem for you. The item "Aerial Dance Hardware Setup Kit for Trapeze Hammock Flying Yoga Lyra Trapeze" is in sale since Thursday, June 29, 2017. This item is in the category "Sporting Goods\Fitness, Running & Yoga\Yoga & Pilates\Yoga Props".123" and is located in Shanghai. This item can be shipped worldwide.